Unscented ostomy deodorizer Just’a Drop is the new & better way to neutralize odours inside ostomy pouches. Helps provide a level of confidence and security. Appropriate for use with ostomy pouches & standard toilets. Eco-Friendly Formula made in Canada. Unscented ostomy deodorizer Just’a Drop is the new & better way to neutralize odours inside ostomy pouches. Great for home & ideal for use in your ostomy pouch. Simply place a few drops into your pouch to help eliminate ostomy odour. After a decade of fighting toilet odours with our popular Just’a Drop toilet drops, our team of experts decided to use their knowledge to develop an odour neutralizer which would help ostomy patients improve their everyday life. Just’a Drop for ostomy is a remarkable breakthrough product for ostomates as it works to eliminate odours in the toilet bowl and is safe to use in your ostomy pouch. How to Use Just’a Drop Ostomy Unscented? Stop odours before they start. 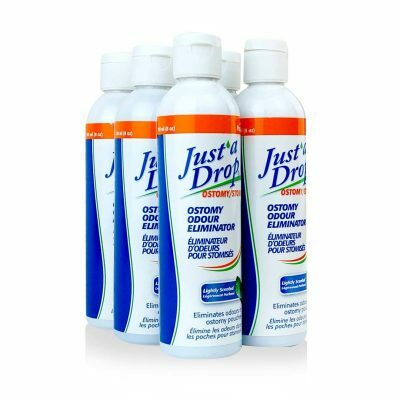 Ostomy drops Just’a Drop is as easy as the name suggests! Put A few drops of this safe, concentrated formula directly inside the ostomy pouch to help eliminate odour when the pouch is emptied. 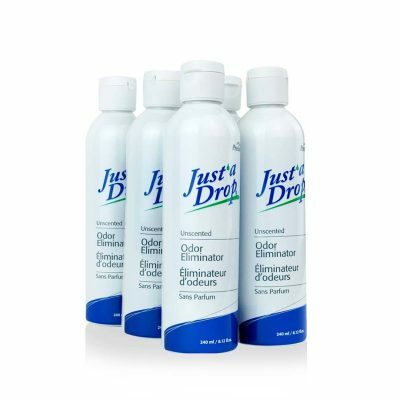 I like the Just a Drop products that are used in the toilet bowl. I find though, that these drops meant for the Ostomy Pouch do not work.